Home Musician’s Friend and Music123 Coupon Codes! 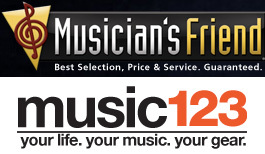 Musician’s Friend and Music123 Coupon Codes! Seems like a sudden surge of coupon codes coming in, and that’s a good thing. Great time to score some deals. I have two new ones from Musician’s Friend and Music123. Musician’s Friend offering a special offer from Saturday May 14 to Saturday May 21. Customers will receive 10% off with coupon code MFMAYDAY at checkout. Click here to start shopping at Musician’s Friend! Music123 is offering a $20 off on any order $150 or more with the coupon code m123save. There are some exclusions, so this may not apply to all items. Click here to start shopping at Music123!